MoonMarble.com - Fritz Lauenstein - "Rainbow Twistback Swirl with Mica"
Art Glass → Contemporary Handmade Marbles → Fritz Lauenstein - "Rainbow Twistback Swirl with Mica"
This is a handmade marble by artist, Fritz Lauenstein. 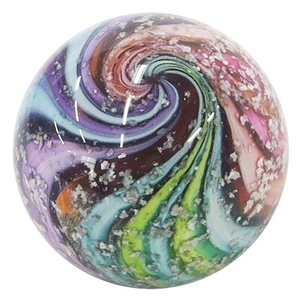 It is a swirl marble in a rainbow of colored canes that have been twisted back and forth giving it a wig wag design. Flecks of sparkly mica float over the surface of the canes. Approximately 1 5/8" in diameter. It is signed with a drawing of a house under flames.